For each of the questions below a short clinical scenario is given followed by the 12-lead ECG. Review the ECG (EKG), present it according to the structure in ECG interpretation and attempt a diagnosis before clicking on the plus symbol to see the answer. 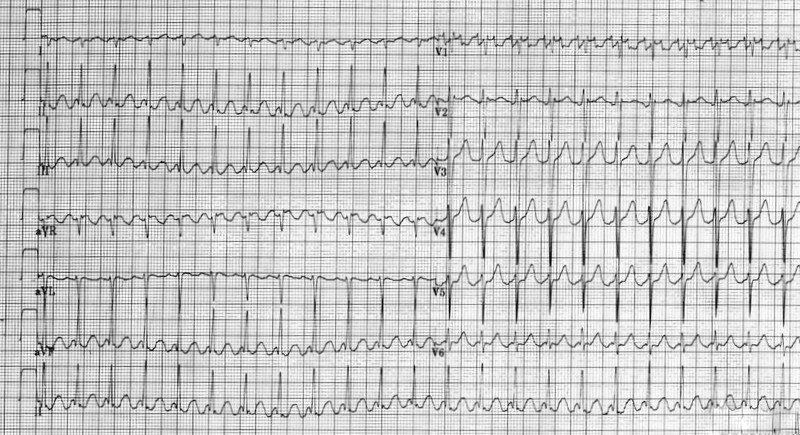 A 35 year old man presents with palpitations. He has been drinking heavily with friends over the weekend. This is his ECG. Present your findings and give a diagnosis. This ECG shows atrial fibrillation (AF) with a fast ventricular response. With this history the underlying diagnosis would fit with a ‘holiday heart’ syndrome. A 45 year old business man presents with a feeling that his heart is racing. He also has some shortness of breath. This is his ECG. Present your findings and give a diagnosis. This is atrial flutter. The atria contract at 300 beats per minute causing a ‘seesaw’ baseline. 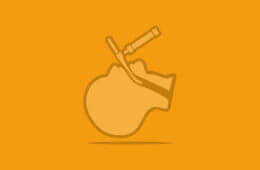 Beats are transmitted with a 2:1, 3:1 or 4:1 block, leading to ventricular rates of 150, 100 and 75 BPM respectively. A 75 year old man with a history of COPD presents with fever and increased sputum production. An ECG is taken in the emergency department. What does it show? This is polymorphic atrial tachycardia. 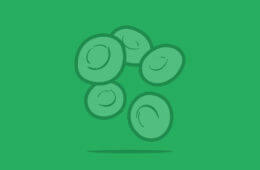 It occurs in respiratory disease and reflects an aberrant foci of atrial excitation. The morphology of the p-waves is therefore variable but all p-waves are transmitted via the bundle of His and therefore the QRS complexes are all the same. A 65 year old man is found unresponsive. He has no central pulse and is making no respiratory effort. Surprisingly someone has done an ECG. What would you do? We will not go through the ECG as the most important information is in the clinical history. 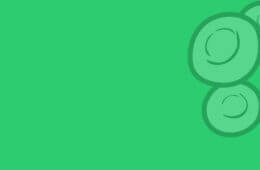 This is pulseless electrical activity (PEA). It is the most extreme example of why you should look at the patient in conjunction with the ECG! 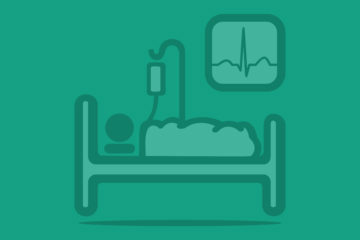 There are no specific ECG changes in PEA – the most important thing is to recognize that this patient is in cardiac arrest and to start chest compressions and Advanced Life Support (ALS) immediately. However, the ECG may help you ascertain the underlying pathology. 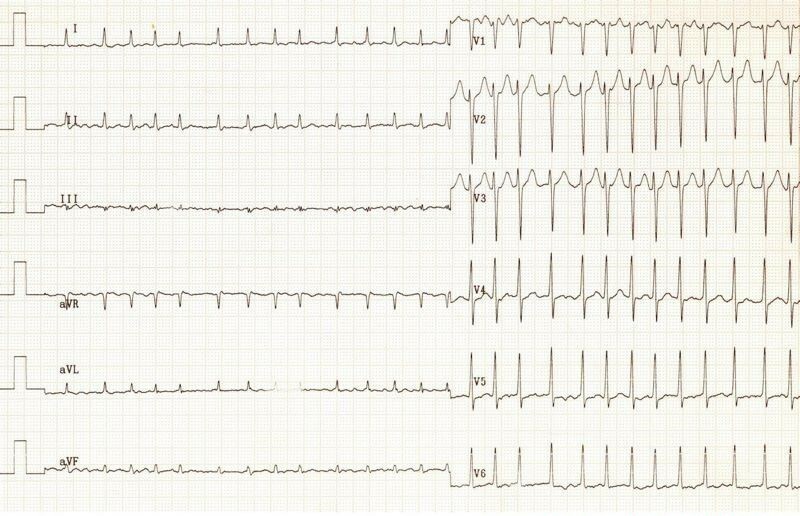 In this case there are low voltage QRS complexes which may simply due to large body habitus or could indicate pathology ‘interrupting’ the signal between the heart and the electrode. This can include pericardial fluid or pneumothorax. This is worth thinking about as tamponade and tension pneumothorax are both reversible causes of PEA. A fit and well 31 year old man presents for a routine insurance medical. This is his ECG. Present your findings and give the diagnosis. This is a normal ECG. There are many variants of normal and it is worth looking at as many ECGs as possible to get exposed to the common variants. It is crucial to remember that a very sick patient can have a normal ECG so always use all the information available to you and don’t rely on the ECG alone. A 65 year old man with a history of ischaemic heart disease is found unresponsive. He has no central pulse and is making no respiratory effort. This is his ECG. What is the diagnosis and what will you do? This is ventricular tachycardia (VT) and in this case the patient is in cardiac arrest as they have no central pulse. He should be treated as per ALS guidelines with chest compressions beginning immediately. 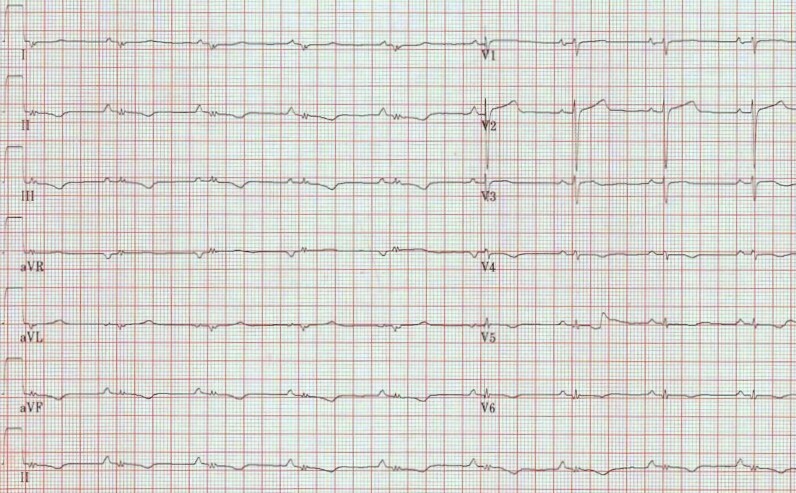 This is a shockable rhythm and should be treated using the ALS algorithm with DC cardioversion and adrenaline. If the patient was conscious the ALS algorithm would not be necessary and management depends on symptoms. If acutely symptomatic urgent DC cardioversion is indicated. If there were no symptoms of decompensation (e.g. shortness of breath, chest pain, shock, confusion, syncope) he could be managed pharmaceutically in the first instance. A 40 year old lady comes to the emergency department from her husband’s funeral with a sensation of ‘fluttering’ in her chest. She is feeling very anxious. An ECG is performed. What is the diagnosis? 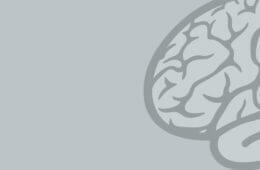 The history makes a sinus tachycardia secondary to anxiety seem likely. However, sinus rhythm rarely goes above 120 BPM and in this case there are no p-waves visible. This is therefore a junctional supraventricular tachycardia (SVT): a narrow-complex tachycardia originating from the AV node. Treatment includes vagal manoeuvres followed by adenosine. Atrial flutter would be a reasonable differential as the rate is regular and close to 150. However, there is no variation in the baseline and not a hint of sawtooth appearance so this is less likely than SVT. A 58 year old man who attends the emergency department with chest pain loses consciousness whilst he is having his initial ECG. He has no central pulse and is taking occasional deep breaths. What is going on? 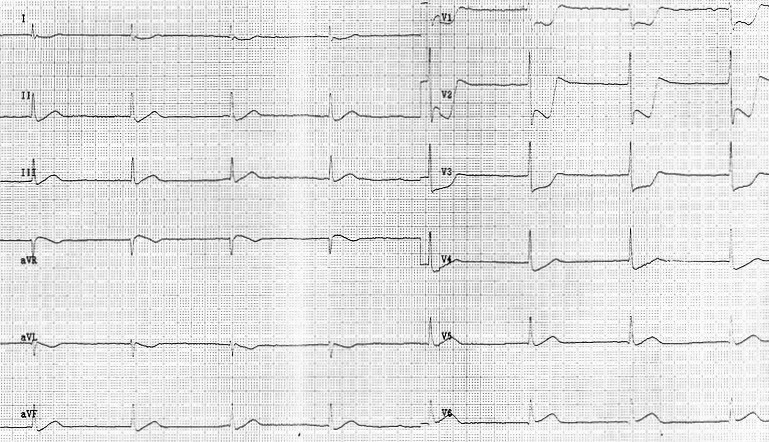 This is ECG initially shows an inferior STEMI, which then deteriorates into ventricular fibrillation (VF). The breaths described are agonal breaths – this does not represent normal respiratory effort and resuscitation for cardiac arrest with CPR should be started immediately. Remember: in collapse with abnormal breathing and no central pulse always start CPR. A 72 year old lady presents with collapse. This is her ECG. Present your findings. How would you proceed? This is sinus bradycardia. In a young fit person this rate may be normal. However, in the context of a more elderly person and presenting with collapse it should be further investigated. A medication review, blood tests including thyroid function, repeat ECGs, chest x-ray, echocardiogram and 24-hour tape would be reasonable first-line investigations. A 60 year old man presents with tight central chest pain radiating to his left shoulder. This is his initial ECG. 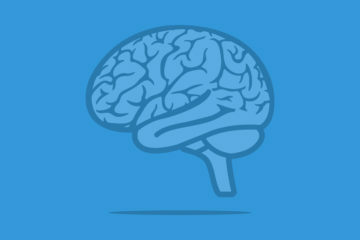 Present your findings and give a diagnosis. ST/T wave Grossly elevated in V2, V3, V4, V5 and V6. Reciprocal depression in II, III and aVF. 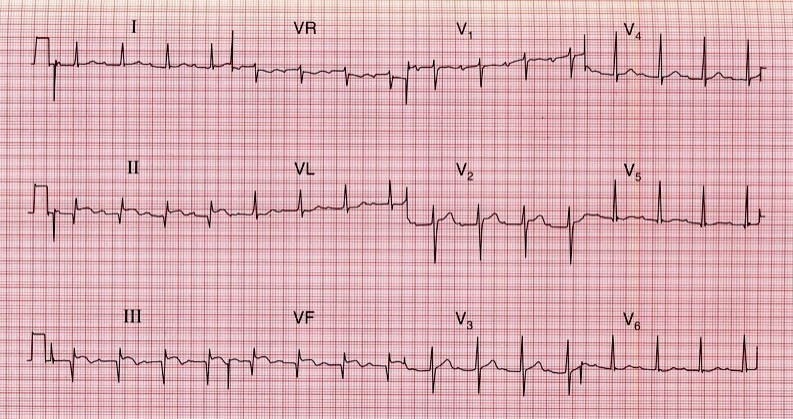 This patient has ST elevation in the anterior and lateral leads. This is therefore an anterolateral ST elevation MI (STEMI). This dramatic ST elevation is also referred to as ‘tombstone’ ST elevation, both for its resemblance to a tombstone and as a reflection on the poor prognosis without rapid intervention. This patient should be assessed and treated urgently for a STEMI, ideally with primary angioplasty (primary coronary intervention: PCI). 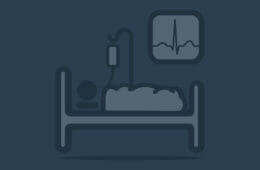 Immediate management also includes aspirin, clopidogrel, heparin, nitrites, morphine and controlled oxygen. A 55 year old renal dialysis patient presents to the emergency department having missed his last session of dialysis due to feeling dizzy and unwell. This is his ECG. Present your findings and give a diagnosis. 1. In the early stages of you may only see tenting or peaking of the t-waves. 2. Later changes involve a decrease in height of the p-wave and increase in length of the PR interval as conduction is slowed through the atrial myocardium. 3. This is later accompanied by widening of the QRS and merging of the QRS complex and the t-wave. This pattern eventually deteriorates to the sine wave pattern seen above. This is a medical emergency. Treatment is with 10ml 10% calcium gluconate for cardioprotection, followed by 10 units of fast acting insulin (with 50ml 50% dextrose) to drive potassium into the intracellular space. Inhaled salbutamol has a similar effect if there is no IV access. Bicarbonate 50ml IV can also be given. 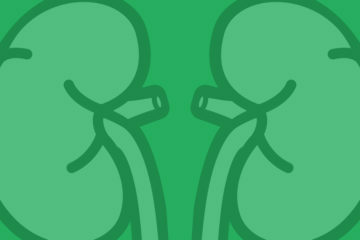 Ultimately total body potassium needs to be decreased – in this case urgent dialysis or haemofiltration is indicated. A 65 year old woman presents with chest pain radiating to her jaw and down her left arm. It feels like her ‘normal’ angina but on this occasion it has not eased with GTN spray. This is her ECG. Present your findings and give the diagnosis. On initial inspection this looks like an inferolateral NSTEMI. There is (we assume new) t-wave inversion in consecutive leads which fit with an anatomical territory (inferolateral) and most importantly there is ongoing ischaemic sounding chest pain not eased by GTN. However, note the ST elevation in aVR. As such, this is more suggestive of critical left main stem occlusion. This ECG should therefore be discussed with cardiology with a view to urgent PCI. A 25 year old man presents with a collapse which occurred as he was playing in a football match. He has suffered episodes of fainting in the past. This is his ECG. What is the diagnosis? 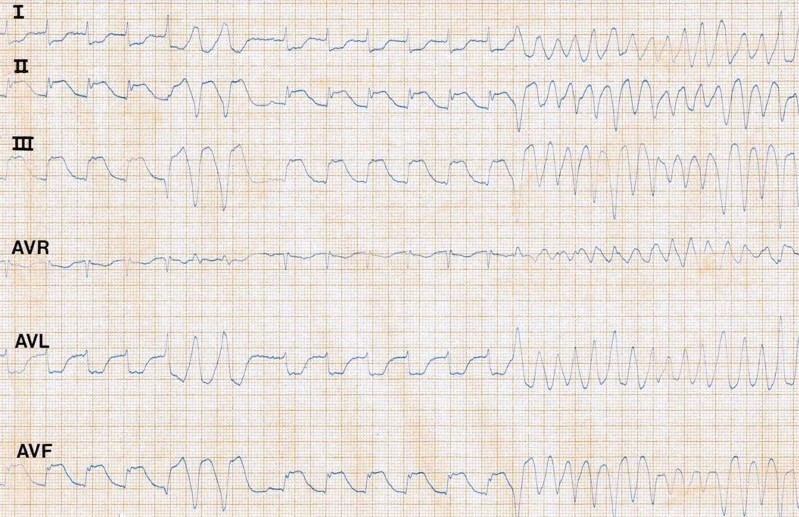 This picture of shortened PR interval and slurred QRS upstroke – also know as a ‘delta wave’ – are typical of Wolff-Parkinson White (WPW) syndrome. These changes represent transmission through an accessory pathway. The history of collapse in this case is concerning as these episodes could be due to re-entrant tachycardias which can be fatal. Other features not seen here which may be present in WPW include a dominant R wave in V1 and T wave inversion in the anterior chest leads. An 18 year old man signs up to join the army. He is fit and well. This is his ECG taken at his medical examination. Is it normal? No it is certainly not normal. 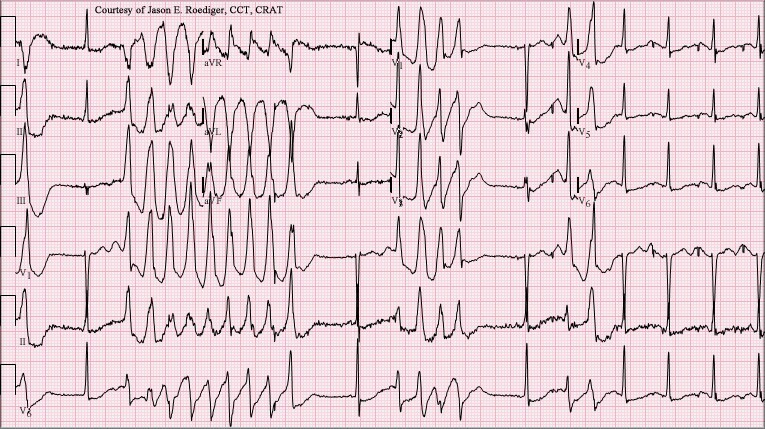 This ECG is characteristic of Brugada Syndrome (Type 1). In leads V1 – V3 there is >2mm ST elevation, the T waves are inverted and the ST segment has a characteristic ‘coved’ shape. 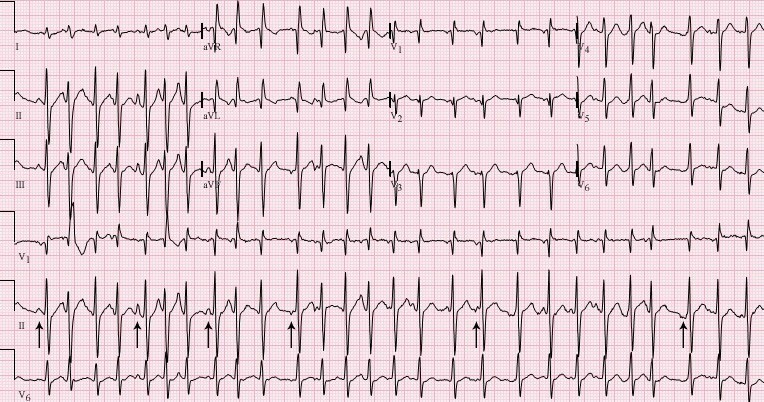 This condition has a high risk of sudden death from ventricular fibrillation (VF). Treatment is with an implantable cardioverter-defibillator (ICD). A 58 year old smoker presents with tight epigastric pain. He looks sweaty and unwell. One of the nurses shows you his routine ECG. What is the diagnosis? This is acute posterior MI. What we see in the anterior leads is the equivalent of ‘upside down’ ST elevation. Imagine flipping the ECG paper over and looking at it from behind or looking at the ECG in a mirror held along the inferior border. You would see ST elevation (the deep ST depression reversed), t-wave inversion (upright t-waves seen upside down) and this represents what is going on in the posterior region of the heart. 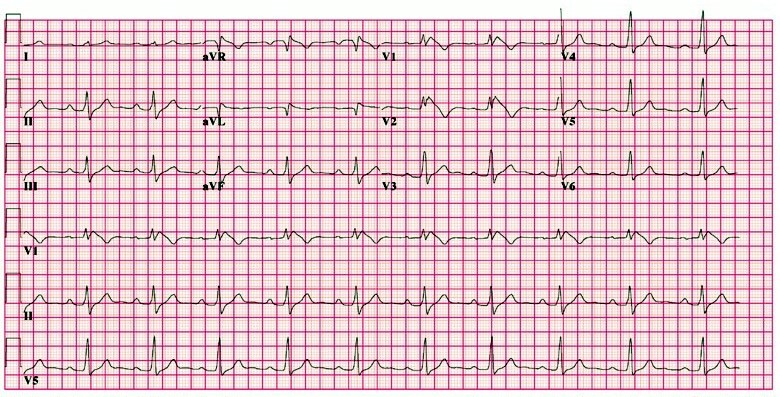 Another clue is the bradycardia seen in this case: the vessels supplying the posterior of the heart also supply the ‘pacemaker’ region of the SA node. 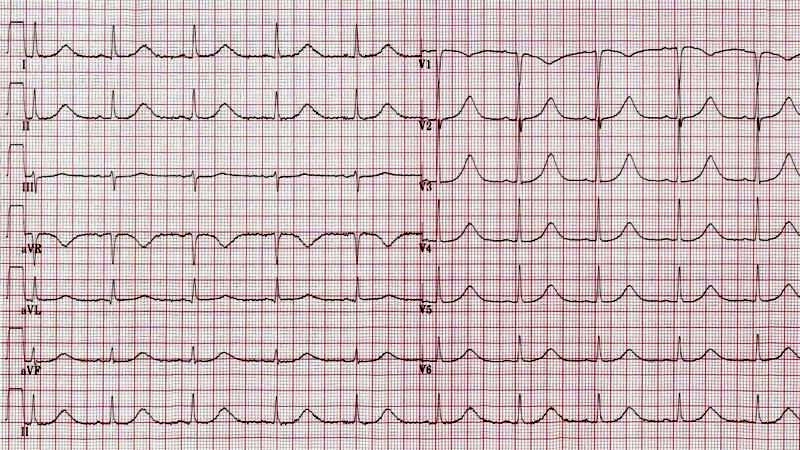 A 29 year old presents with central chest pain. She has a history of recent flu-like illness but no significant past medical history. This is her ECG. What is the diagnosis? The diagnosis is pericarditis. 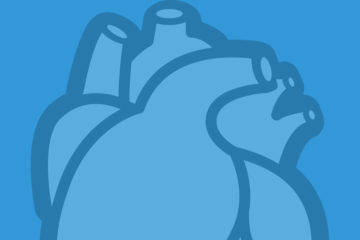 Pericarditis often presents in young people after a history of viral illness. He you can see the characteristic widespread saddle-shaped ST elevation and PR depression. 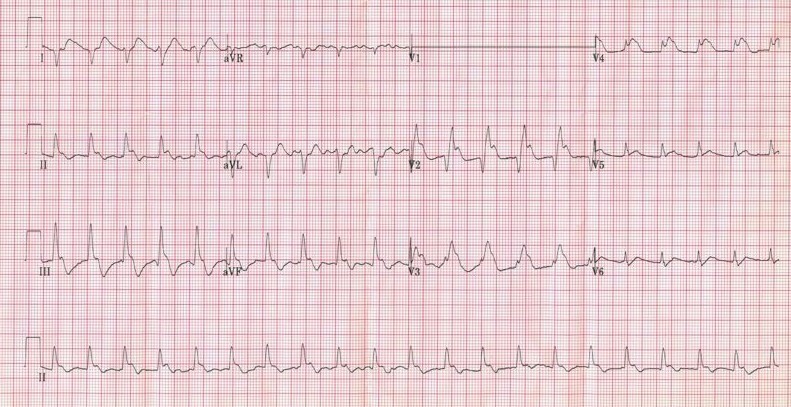 A 70 year old woman presents with sudden onset of chest pain. The pain is crushing in nature and radiates up to her jaw. This is her ECG. Present your findings and give the diagnosis. This ECG shows ST elevation in the inferior region of the heart. This patient should be assessed and treated urgently for a STEMI, ideally with primary angioplasty. 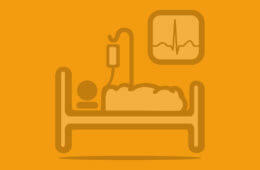 Immediate management also includes aspirin, clopidogrel, heparin, nitrites, morphine and controlled oxygen. A 45 woman has just stepped off a flight from Japan when she develops severe pleuritic chest pain and shortness of breath. On examination her chest is clear. Present your findings. What is the most likely diagnosis? Given the history, examination and ECG findings, pulmonary embolism (PE) is the most likely diagnosis. 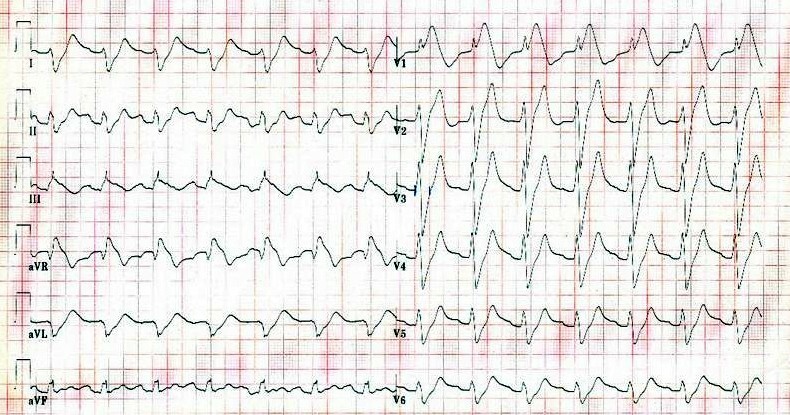 In PE the constellation of ECG findings of ‘S1Q3T3’ is classically described. It refers to a deep S wave in lead I, pathological Q wave in lead III and inverted T in V3 (and other anterior leads). However, though it may be classical it is extremely rare in clinical practice! 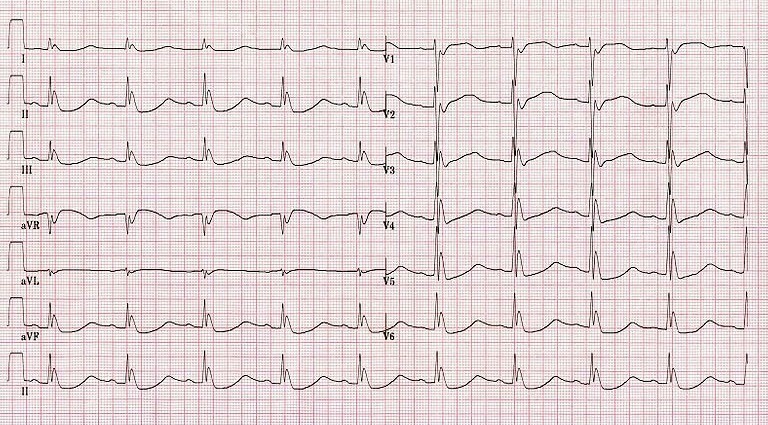 The most commonly observed ECG abnormality in PE is a sinus tachycardia. There may also be RBBB or a RV strain pattern with T wave inversion in V1 to V4. It is early January and a middle-aged man is found lying in a park. He is surrounded by bottles of Buckfast and has a GCS of 9. An ECG is performed in the ambulance. What is going on? This patient is hypothermic. 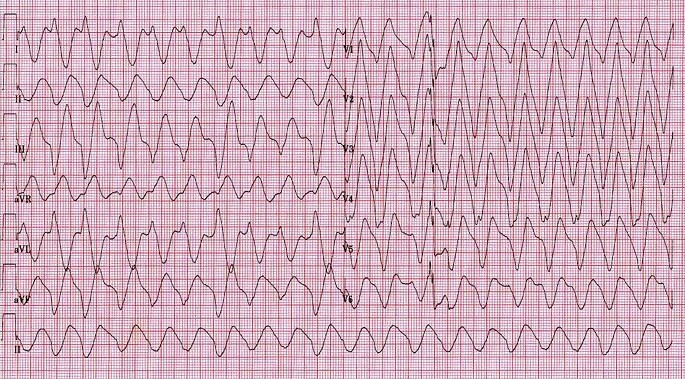 The positive deflection after the QRS but before the t-wave is an Osbourne J-wave; these can also be seen in subarachnoid haemorrhage (SAH) and hypercalcaemia. Classically a hypothermic patient is bradycardic and their ECG will show J-waves. 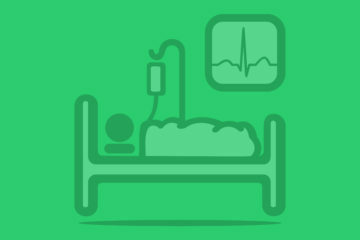 Treatment in this case would be with gentle rewarming provided there was no immediate risk to life from an arrhythmia. A 61 year old woman presents to the emergency department with diarrhoea and vomiting. She has recently been started on furosemide by her GP for hypertension. What has happened? This ECG shows changes consistent with hypokalaemia. This has likely be precipitated by the new loop diuretic. Note also that furosemide is not a first-line treatment for hypertension. Classically hypokalaemia causes t-wave flattening with ST depression. In severe cases you may see a U-wave. This is a positive deflection following the t-wave but preceding the p-wave. These are found in hypokalaemia but also in hypercalcaemia and thyrotoxicosis. An 18 year old lady is found collapsed at home. When you see her she has a GCS of 10 and you notice that her pupils are dilated. This is her ECG. Present your findings and give the diagnosis. The diagnosis is tricyclic antidepressant overdose. This causes widening of the QRS complex and lengthening of the QT interval due to blockade of sodium channels. A 45 year old man is found collapsed at home. There is no history available. This is his ECG. What is the diagnosis? 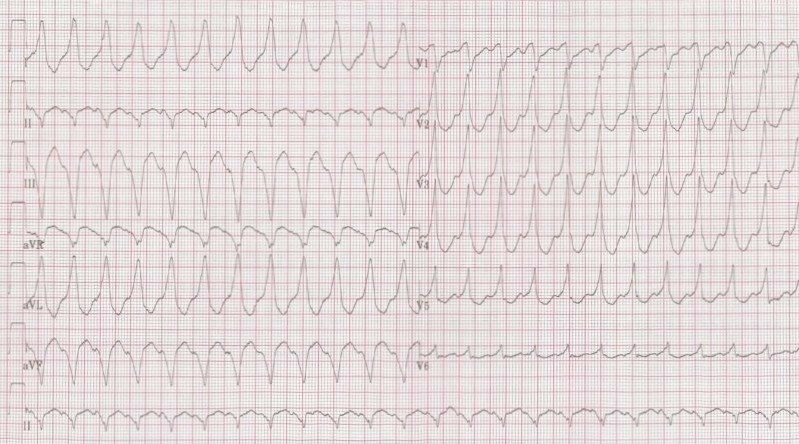 This is a difficult case and shows runs of polymorphic VT or Torsades de pointes (literally translated as twisting of the points). 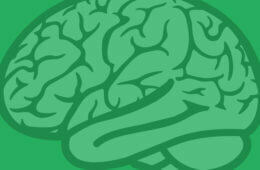 It has a number of causes including medications (especially psychotropics) and electrolyte imbalance. Essentially any cause of long QT can precipitate polymorphic VT.
Management in the first instance is magnesium 2g IV, independent of serum magnesium concentration before treating any other cause of long QT. 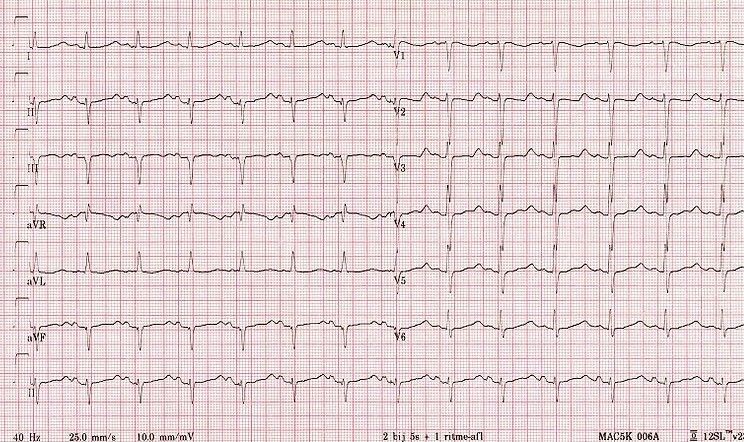 A 50 year old man presents with collapse. He has been unwell recently with a chest infection for which he has been prescribed clarithromycin from his GP. He also takes medication for his hayfever at this time of year. What is most concerning here? This patient has a prolonged QT interval and a cause for this should be sought. Medications are the likely culprits in this case: both clarithromycin and the antihistamine diphenhydramine can cause prolonged QT interval. The normal length of the QT varies with heart rate and there is a formula that is applied to correct for this. ECG machines automatically provide you with this ‘corrected QT’ (QTc). Normal QTc is generally under 480ms. As a rule of thumb, if the end of the QT interval is over over half way to the next QRS then consider long QT.